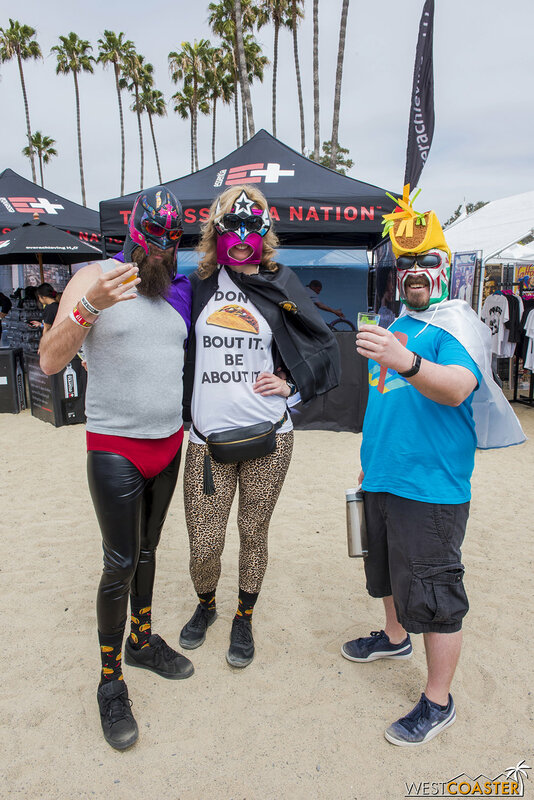 Hey, remember that time last year when we attended a groovy music festival that also featured beer, tacos, and even some wacky lucha libre wrestling? Well, the folks over at Sabroso Festival decided to stage another event this year, and would you believe it? They invited Westcoaster to come back a second time to cover the festivities, even though Dan could hardly contain his taco, beer, and rock music excitement in a dignified and classy manner. 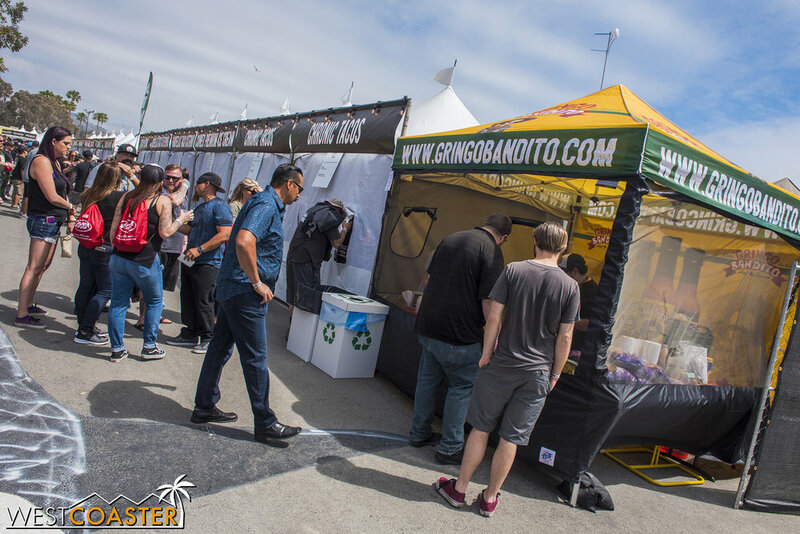 Yes, this Saturday was the second edition of the Sabroso Taco Festival in its current iteration as a music and craft food and drink production. 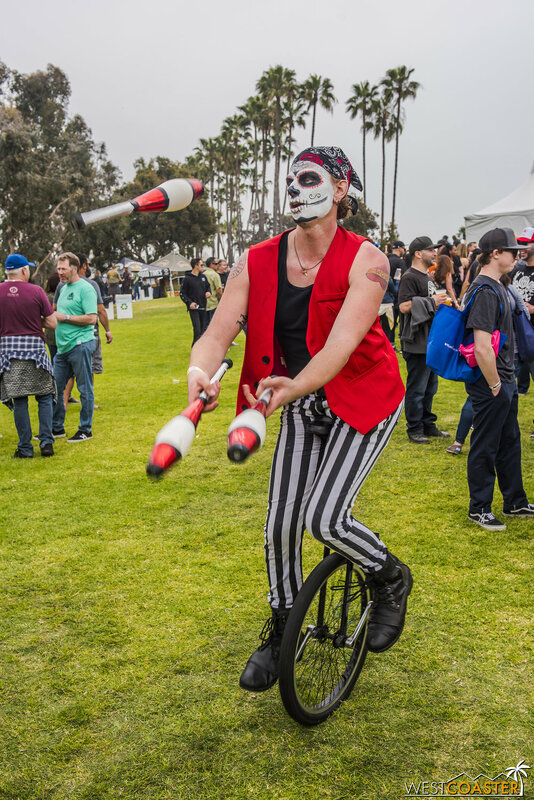 Held once again at Doheny State Beach in South Orange County's Dana Point, it was actually the kickoff to a series of Sabroso Festivals crossing the western United States. The very next day, the festival made a stop in Sacramento, and later this month and through next month, Sabroso Fest makes stops in cities like Denver, Albuquerque, Portland, and Tucson. 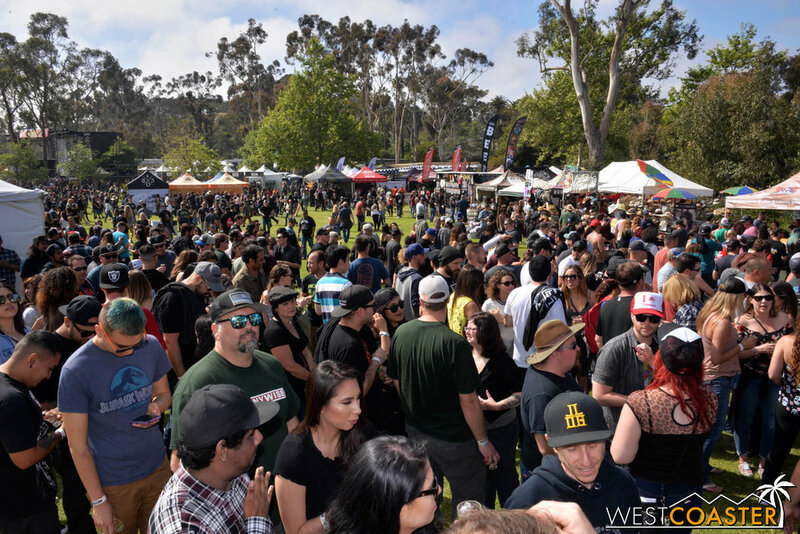 Plenty of people showed up at the 2018 Sabroso Taco Festival in Dana Point this past Saturday. The line-up was pretty fun. Punk rock legends The Offspring and Pennywise headlined the bill, and they brought along some of their friends, like The Vandals, Unwritten Law, and Me First & The Gimme Gimmes. Add do that a great selection of craft beer samples, a series of taco stands, and some exciting and engaging lucha libre wrestling, and you had another fantastic festival that we once again greatly enjoyed. And so did 6500 other folks--with the backing of Southern California rock radio station KLOS 95.5FM, the event once again sold out. So with that overview out of the way, lets check out what went on this year! To the organizers' credit, they stuck with a layout and formula that worked last year. Guests parked at one of two beach lots and were funneled into the event through a main entry on the southeast side of the beach grounds. Fencing separated the actual beach from a set-aside park and lawn area, and once guests came through, they found a layout that paralleled last year's relatively closely. Beer sampling mainly on the beach, a line of food stands near the entrance, the stage and a VIP section on the far end of the grounds, and various vendor stands to the right. It was an overcast day when we arrived, and though the sun would eventually emerge through clearing clouds, the temperature remained very comfortably in the 60s throughout the day. 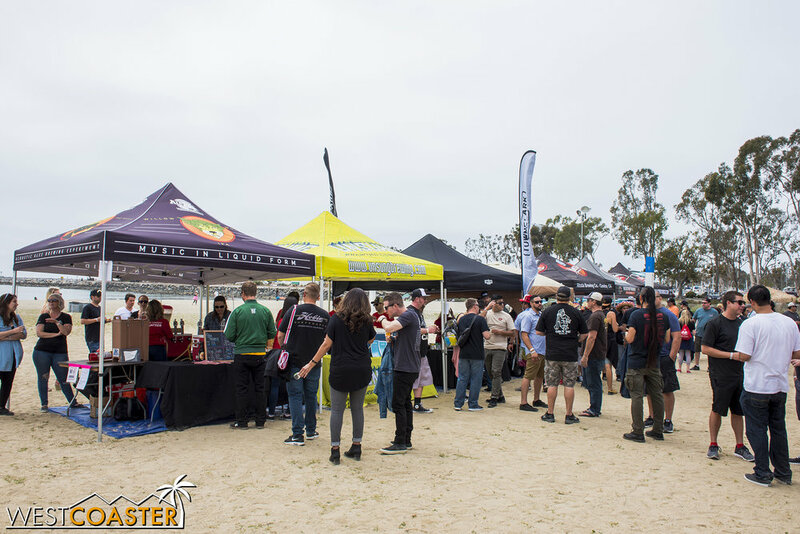 Despite being on the beach, it wasn't really that windy, and that made for a great atmosphere in which to hold a taco, beer, and rock festival. There seemed to be more people at the festival early compared to last year. 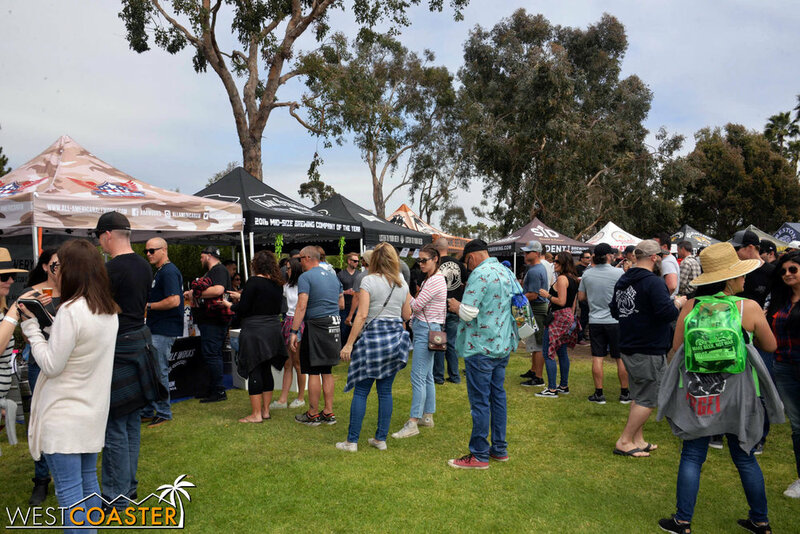 Perhaps word of mouth had spread on the highly favorable qualities of getting the VIP pass, which allowed guest to enter the grounds at noon instead of the 1pm general admission. This provided a more relaxing experience for the first hour, before the rest of the festival guests entered. Hey, it's the set times for the day! The stage scene early in the afternoon. Gringo Bandito was there. 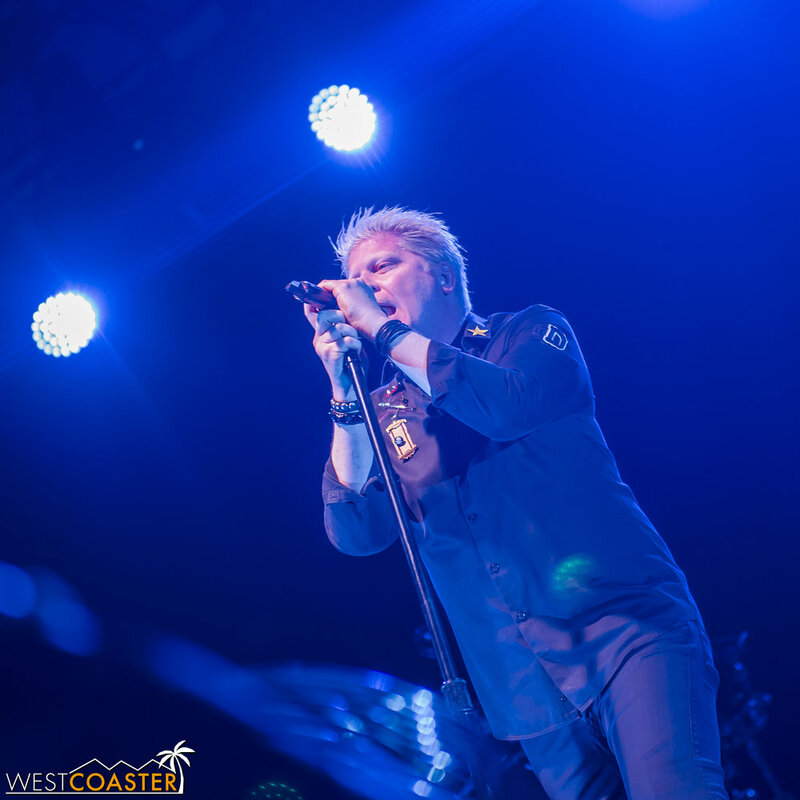 They were one of the sponsoring members and also happen to be hot sauce of Offspring frontman, Dexter Holland. By mid afternoon, there plenty of people on hand. Ohh, he's got multiple skills! 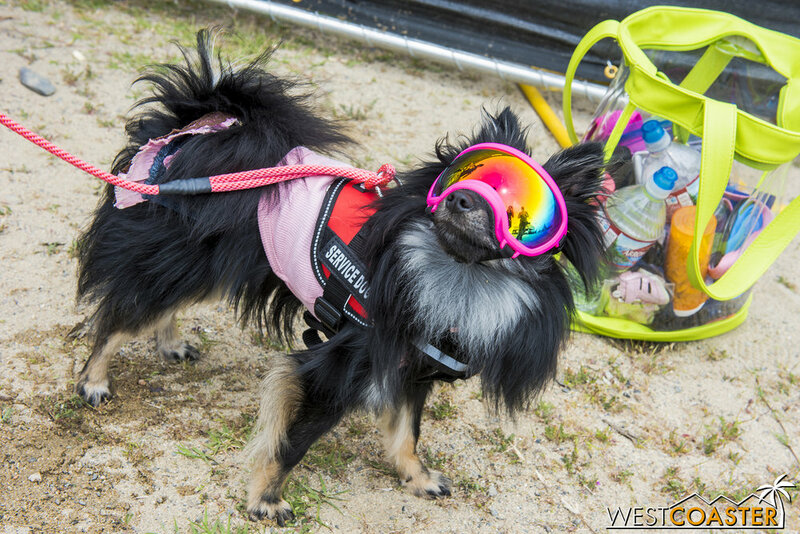 Even furry, four-legged creatures got into some of the celebratory spirit. The highlight for a lot of guests was the beer sampling. 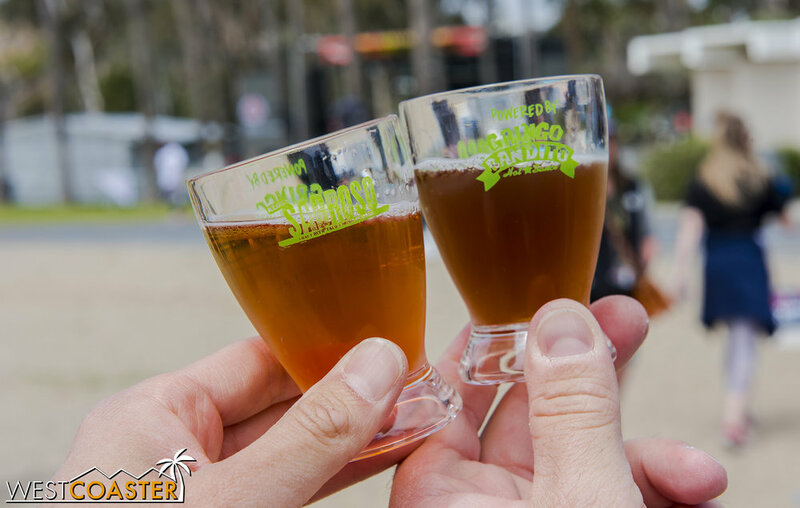 Just like last year, every guest received a small tasting goblet and access to beer booths from a variety of local craft breweries both big and small, with free tastings offered until 4pm. The set-up this year was a bit different, with booths arranged in a more linear fashion as opposed to last year's rectangular or square clusters. This seemed to improve guest flow a little better. It also didn't hurt that a few beer sampling booths were distributed toward the lawn area as well. 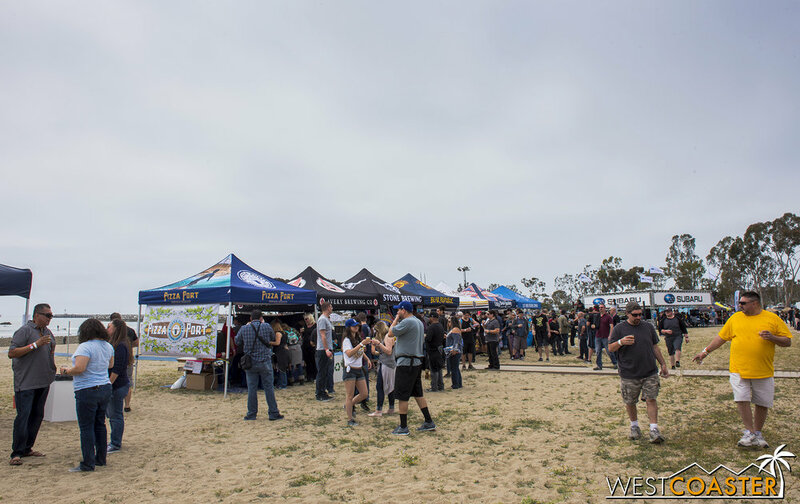 And with 59 different breweries representing--each with anywhere from two to four different beers to offer, there was definitely plenty of different potent potables to sample! Tasting glasses were once again offered, complimentary, to all paying guests. The beer set up was a little bit different this year and more linearly oriented. Each brewery had its own tent with its own branding. It provided better brand recognition and identity, especially for guests making a beeline toward their specific favorite booze-maker. We took advantage of the 12-1pm VIP hour, before the general public could enter, to avoid the lines. Waits were pretty minimal during this first hour. 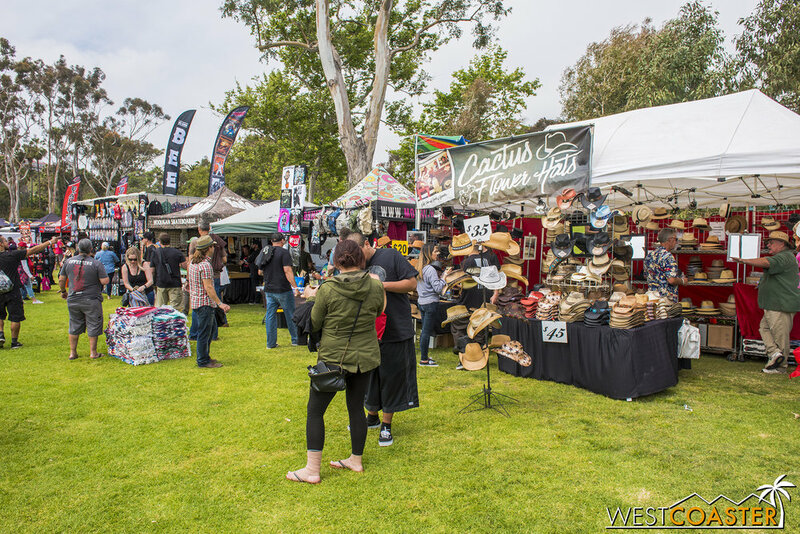 But things would get busier later on, especially over in the lawn area, where more beer vendors were distributed. It was nice to spread the alcohol tastings around to avoid overcrowding and bottlenecks. 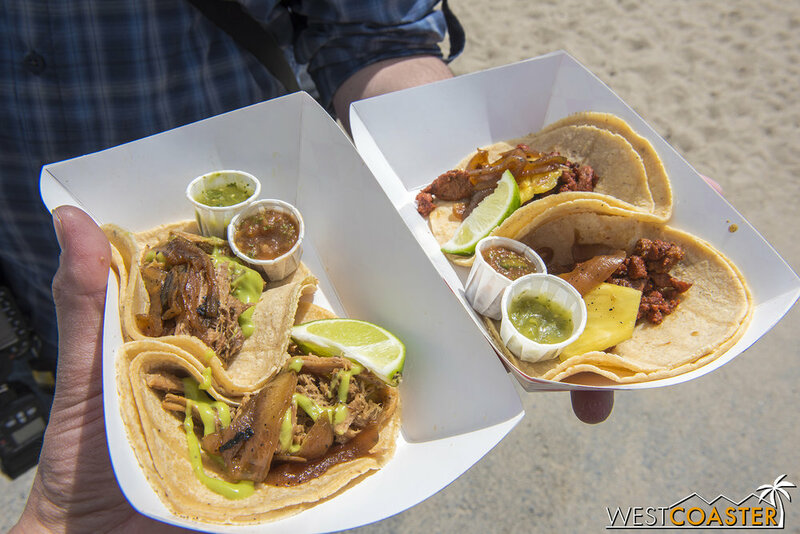 Conversely, and this was our only notable quibble with the festival--the actual taco selection seemed to be a notable step down from last year. Whereas there seemed to be at least three dozen different taco trucks or taco vendors in 2017, this year's number seemed to be a third of that. And while there were still certainly some tasty selections to be offered, we did wish the variety of tacos could have been closer to last year's count. This also contributed to increased lines for food throughout the day. With less places but the same amount of attendees and people bound to get hungry (especially after drinking all day), the math certainly was not in the favor of those waiting for food. Whereas last year, there were several dozen food stands, the taco selection this year seemed to be a little bit lesser. There were still plenty of great tacos to try, though. Loaded carne asada fries, anyone? These pork belly and pulled pork tacos from the Chubbie Monkey food truck were pretty memorable. So delicious! While the crowd was lively and spirited, it also seemed to Dan and myself that there were fewer fans who came in costume or something thematically elaborate and accurate this year compared to our trip last year. 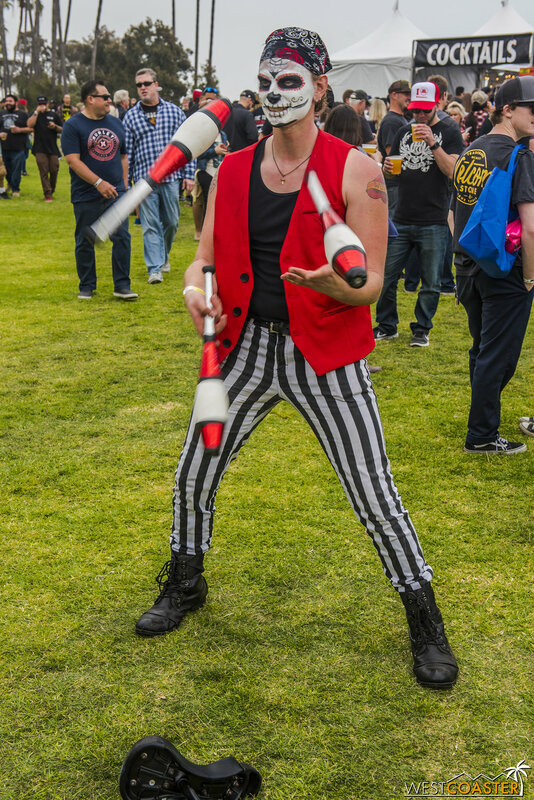 This isn't particularly the fault of the festival, and we also may have just happened to miss the bulk of the creatively interesting costumes, but we did find ourselves wishing there had been more outrageous character types on hand. Fortunately, the energy level of the crowds as a whole remained high. Whether it be crowd surfing or circle pit moshing in the general admission areas or riled up and silly interactions with the lucha libre wrestlers, everyone seemed to be eager to have a fun time. We spotted these guys waiting in line before the gates opened, and also frequently throughout the day. They certainly stood out! Some guests imbibed in a bit of sugarskull aesthetics. Former and legendary Knott's Scary Farm talent, MonStar, was on hand to support a couple of old haunt friends who were wrestling. And also to support his belly with beer. There were plenty of people not dressed up who were enjoying the scene as well. And a few lucha libre fans. A great way to show spirit and avoid blackmail photos if you get a little too blitzed. Plenty of music fans on hand too, of course. The pit grew and grew as the day went on. People were definitely enjoying the festivities. Also, to make up for the lack of dress-up photos compared to last year, lets just take a brief tour of how Dan lasted on Saturday during his time at Sabroso Fest. Something tells me that he may have succumbed to effects of alcohol and agreed to a variety of ridiculous poses throughout the day. So Dan really, really, REALLY loves Pizza Port. Practically in a Biblical way. If Dan was a taco beer superhero, he would be himself. Without diabetes. Our favorite resident Italian made sure to engage every single photo op. Just have a different pose! Behold... the mighty beer tasting goblet! Did I mention how much Dan loves Pizza Port? All this activity and beer left Dan tuckered out by the afternoon, so he check(er)ed out. 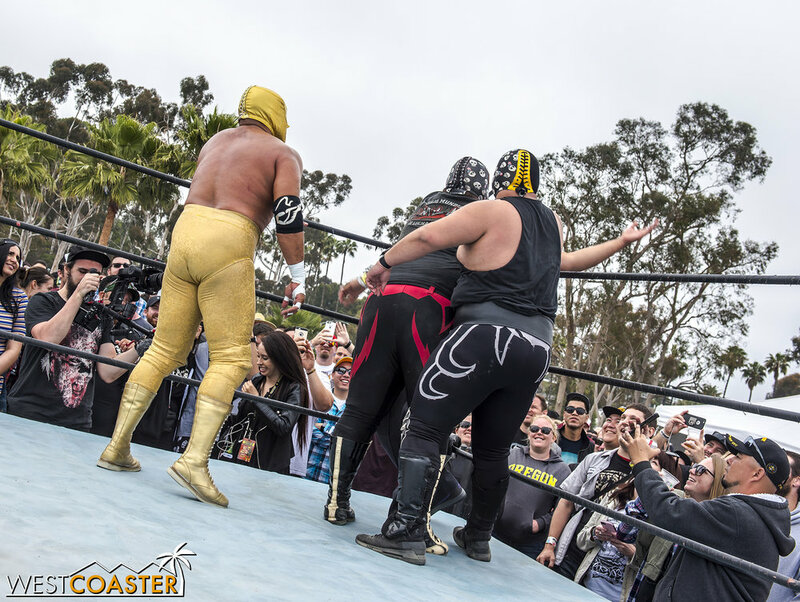 Just like last year, there were four rounds of lucha libre wrestling, each occurring between two music sets. The action was primarily a tag team affair, as a tournament of sorts emerged to crown a pair of championships in the final match. Pro wrestling is a strange, outlandish, and fun communal experience, and the wrestlers who performed certainly put on an entertaining show that connected with the audience. The performers employed classic face/heel (good guy/bad guy) dynamics and often took the action out of the ring, giving viewers a pretty intimate experience of the luchador combat. With antics that wavered from serious slobberknocker wrestling to gimmicks designed to get a laugh, the matches were all pretty fun to behold. Sadly, last year's champions were surprisingly pinned in the second round, after challenging the reigning heel team to an impromptu match after their first one. With a few villainous tactics employed, the bad guys ended up picking up a quick and shady victory that would ultimately lead them to the finals. One of the great parts of the lucha libre wrestling was the communal aspect, and how collectively, the audience could take on a personality of its own. Even though the match performances were scripted, the athletic showcases were still real, and it was impressive to see the wrestlers--who ranged in all shapes and sizes and backgrounds--do their thing in the squared circle. Have you ever met an Australian luchador? Well, here's one. 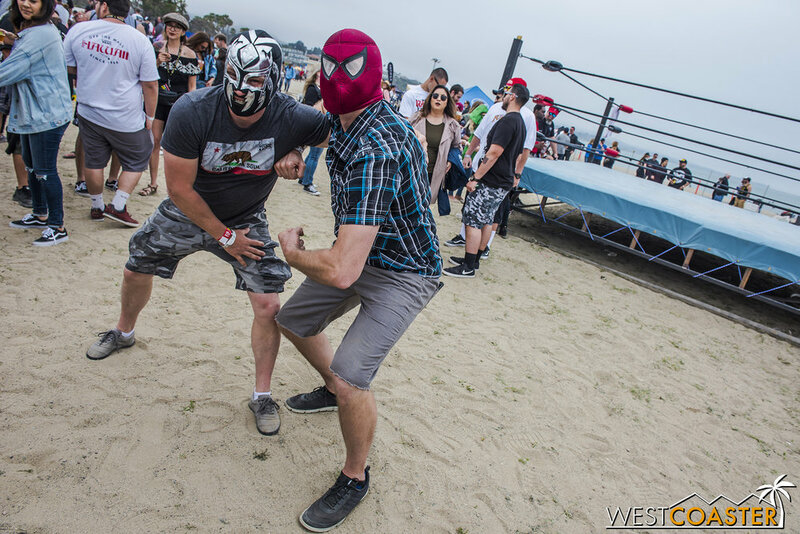 The festival showcased lucha libre wrestling once again this year. They featured tag team action on four separate sets, each after the conclusion of a band's gig. The championship match featured a lot of shennanigans, such as the heels using folding chairs in painful downtown demolitions. And then the faces repaying the favor! The energy was infectious, and the crowd played right along into this display of sporting soap opera theater. The bruisers provided an athletic and fun show! 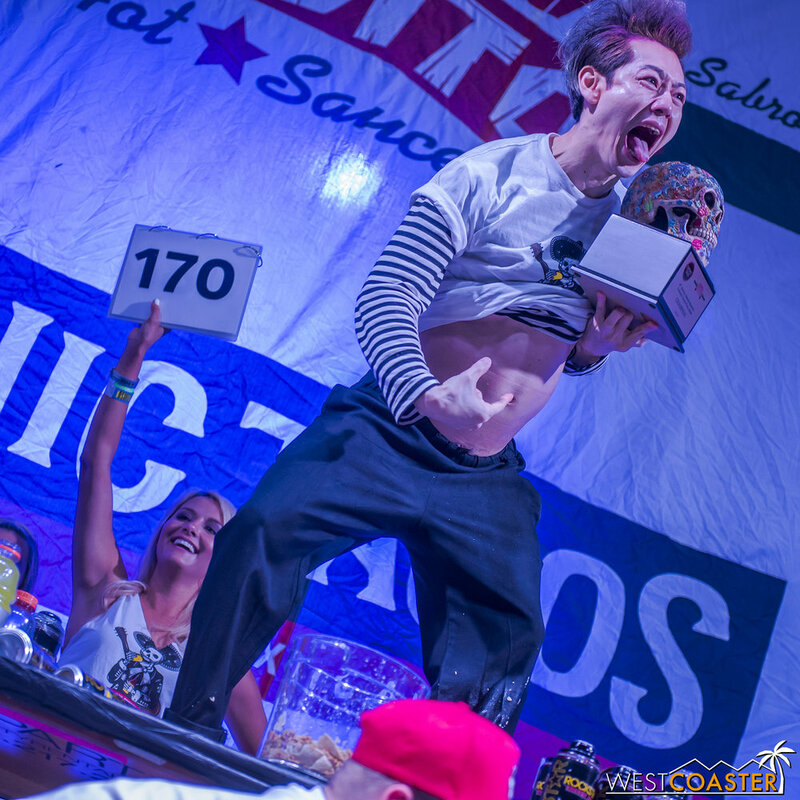 Last year, the Sabroso Taco Eating contest was dominated by competitive eating champion, Takeru Kobayashi, who devoured a world record 159 tacos in only ten minutes! Trailing him and setting a female record was Molly Schuyler, who downed 139. Both were back this year, along with eight other competitors, to see if they could outdo last year's performances. Hosted by Wee Man and... um... another gentleman whose name I missed... this year's contest featured much of the same results, with Kobayashi and Schuyler once again finishing 1-2. Unfortunately, though he plowed through an unofficial count of 170 tacos, once the weigh-in of excess taco pieces not completely consumed was conducted, the Japanese legend's official tally only totaled 154 tacos, falling short of breaking his record. Still, it was enough to win the $5000 first place prize. Just as it was last year, the eating contest was a display of grotesque eating ability. 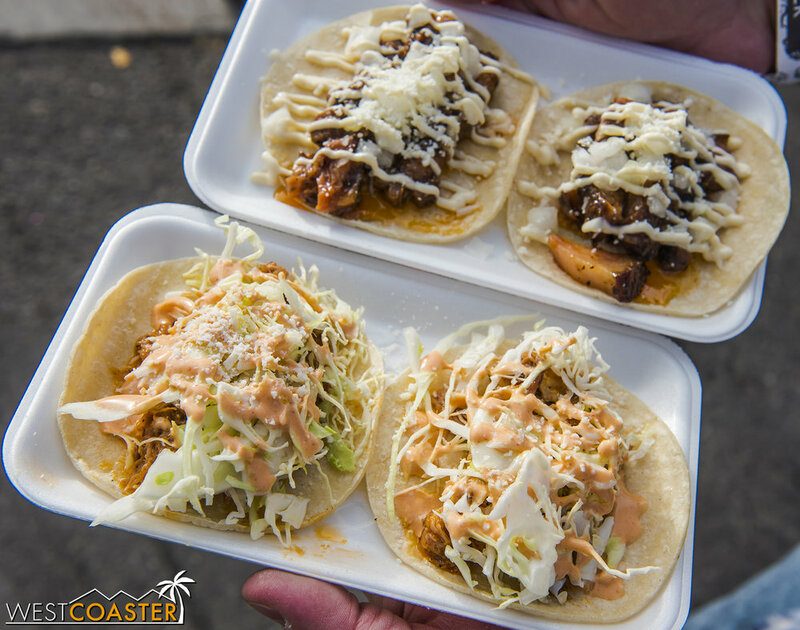 Most people would be hard pressed to put down a dozen tacos in ten minutes, but the competitors on stage easily downed dozens upon dozens of tacos during their allotted time. It was fascinating to see different strategies that involved when to drink water, what to dip in water, and even various swallowing techniques (Kobayashi, for example, doing the "Kobe Shake" and imitating a pelican swallowing a prey hole at times. The crowd was certainly abuzz with morbid fascination at the eating prowess of all the competitive eaters. It all made for an exciting intermission between Pennywise and the main event, The Offspring. Wee Man, one of the owners of Sabroso Fest sponsor, Chronic Tacos, co-emcees the taco eating contest portion of the evening. Kobayashi, back and once again the presumptive favorite. The count of devoured tacos racking up absurdly. 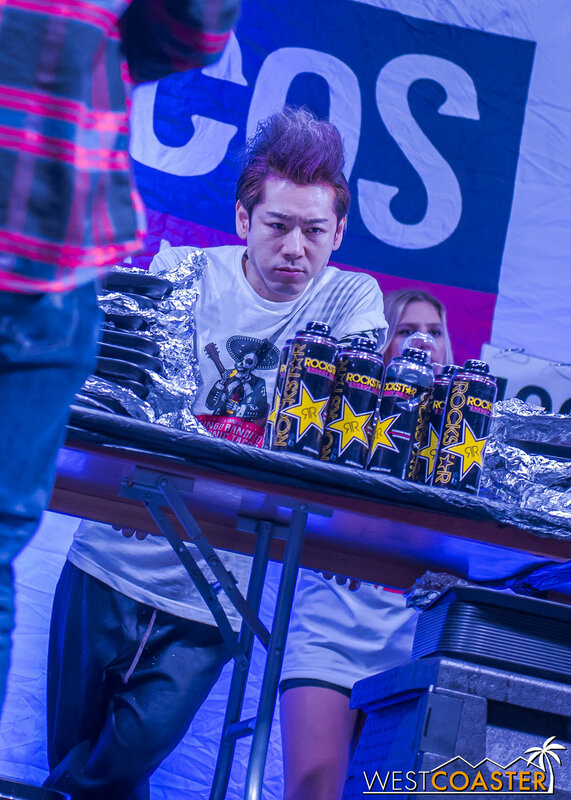 But in the end, the winner and STILL taco eating champion of the world... Takeru Kobayashi!! Although the food and drinks were fantastic draws, what originally drew Dan and myself to this festival was the music line-up, headlined by Dan's favorite and my fifth favorite band, The Offspring. 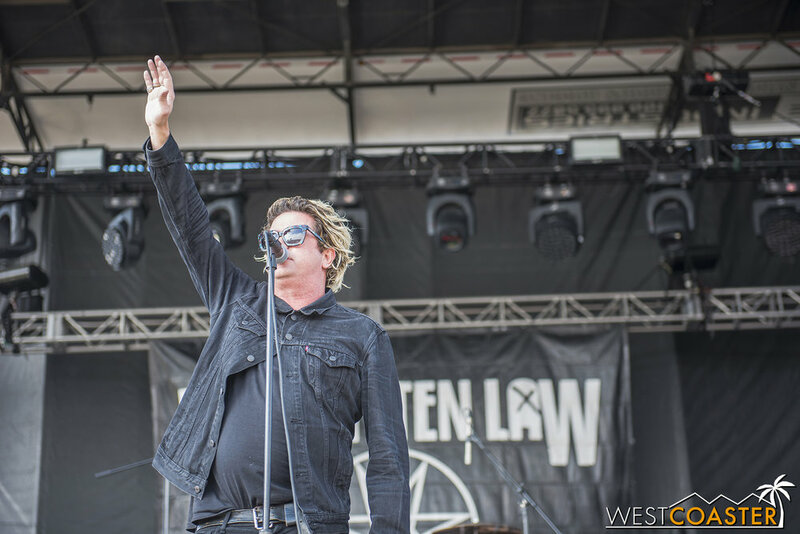 This year, they brought along friends and punk stalwarts, Pennywise, to the fray, along with The Vandals, Me First & The Gimme Gimmies, Unwritten Law, and Los Kung Fu Monkeys--each a venerable band with a lengthy catalog. Opening up the music was relative newcomers, Naked Walrus. The first few acts provided some good energy to set the tone for the day. Despite their relatively young status, Naked Walrus provided some nice grooves and an enjoyable sound. Los Kung Fu Monkeys entertained the crowd with some ska flair, and Unwritten Law really started drawing people in with their set, which included longtime favorites, "Seeing Red" and "Save Me." Things really got fun with Me First & The Gimme Gimmes, a rock supergroup that specializes in cover songs with a general punk rock feel. They provided a ton of energy to really ramp up the crowd, and their renditions of famous hits were unique, catchy, and creative. From "Uptown Girl" to "Take Me Home, Country Roads" to "End of the Road," the variety of songs covered was widespread and quite interesting. The Vandals continued the trend, keeping audiences engaged. 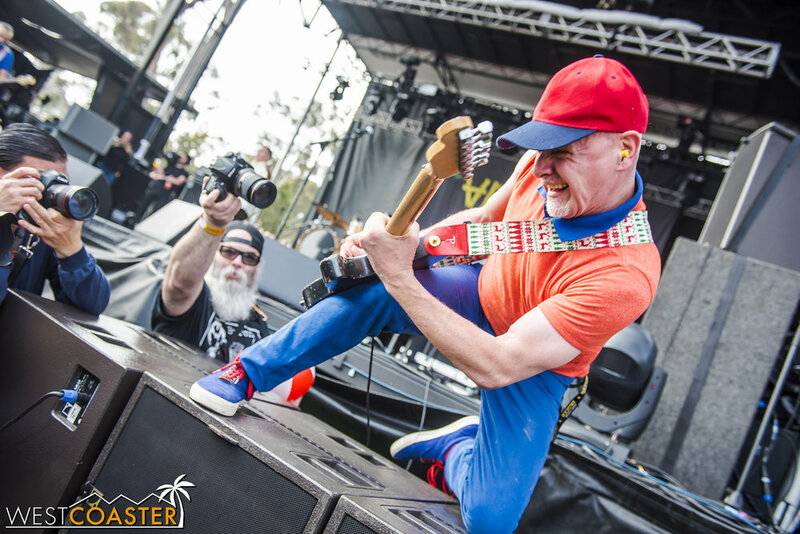 But things really started getting rowdy once Hermosa Beach natives, Pennywise, took the stage. Always known for their excited fans, Pennywise amped up the crowd and openly incited more moshing and crowd surfing and energy. Finally, The Offspring closed out the night with a fantastic, crisp-sounding set that was heavy on their early albums like Americana and Smash. 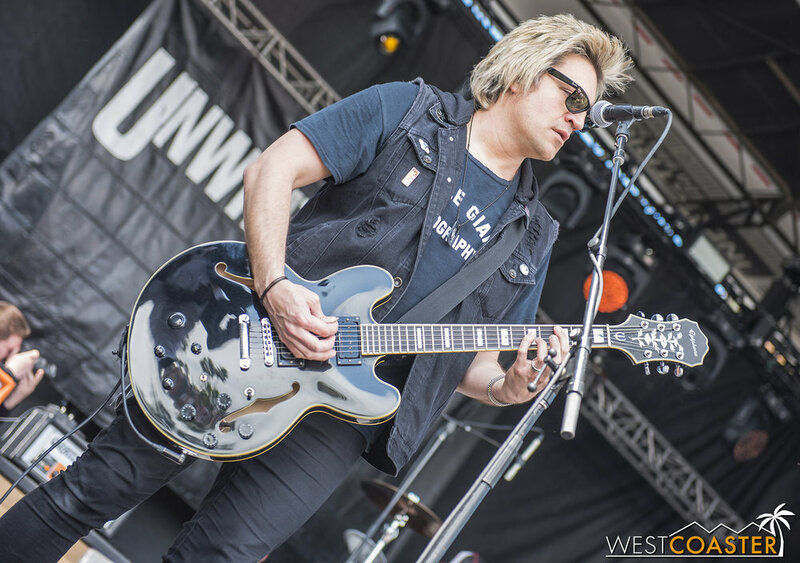 Though Dexter can't quite hit all the high notes these days, he still sounded great on vocals, and the entire band sounded tight and well practiced, despite having played in minimal shows this year so far. They provided a fitting end to a great day, using up their full allotted set time, ending just after the 9:30pm curfew. 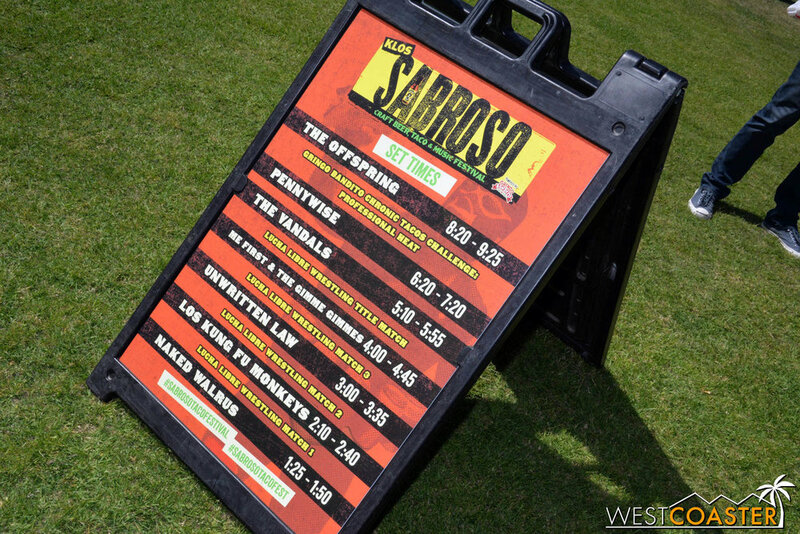 Sabroso Fest 2018 was yet another successful production, and we had ourselves a grand ol' time with the food and drinks and great music and thrilling entertainment. 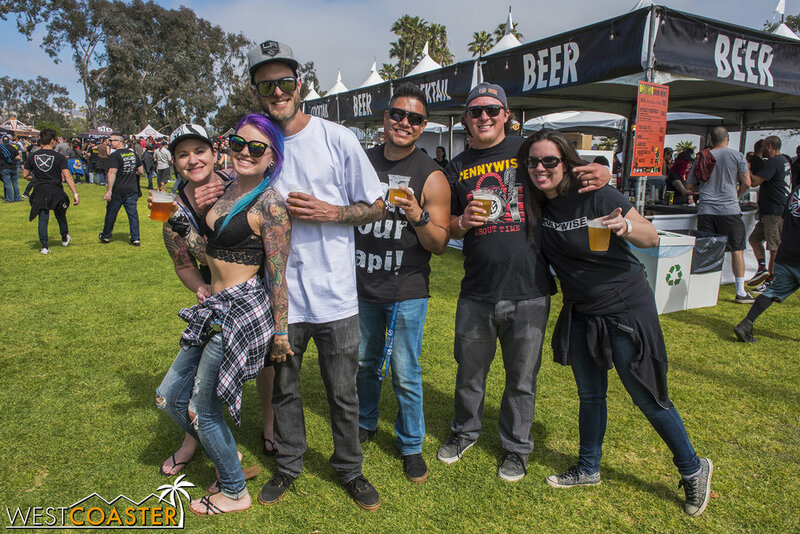 The festival organizers have really hit upon a great formula, and they seem to be replicating it with last year's Punk 'n' Brew Festival and the upcoming Back to the Beach Festival. 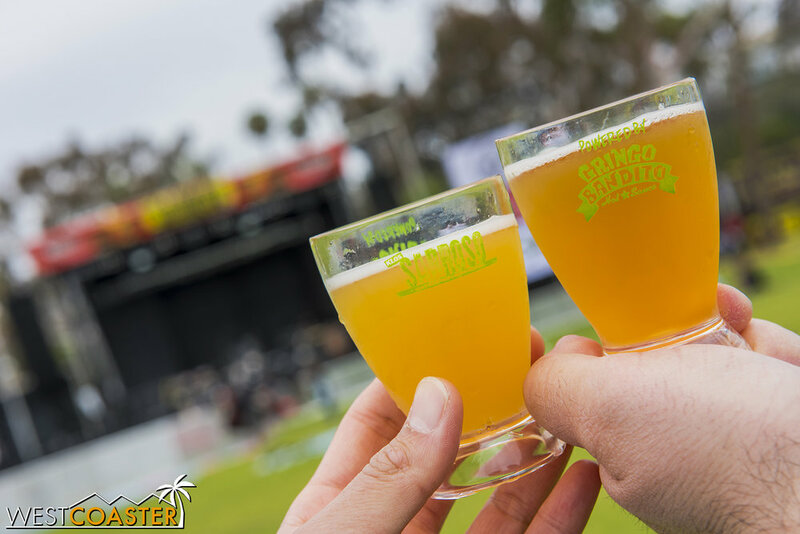 Hey, it's hard to beat good food, good drinks, good music, and good vibes at the beach, plus a few thousand like-minded people just looking to enjoy themselves. 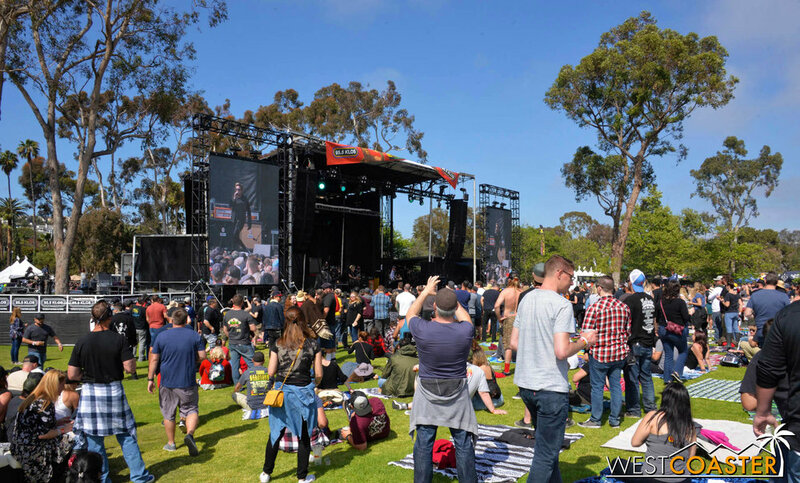 Undoubtedly, Sabroso should return next year, and I highly recommend that rock fans mark their calendars for this time of year in 2019 to check out the next SoCal Sabroso Fest. It's a terrific event, and definitely one we look forward to attending again!